"Angels: A book for self realization through angels and your personal guides-" is a quick-read. 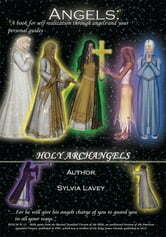 In this Angels book author Sylvia Lavey writes about her personal experiences with angels and guides. Page 1 - "Human beings have been fascinated with angels since the beginning of time, and rightly so, since angels have always been here helping, guiding, protecting, encouraging, healing, and most of all, giving their love wherever it is needed..."
..."I will only be writing in this book about good angels, those angels who do loving and kind things for everything and everyone. Since fallen angels are at the other end of the spectrum..."
In the beginning of her book, the author injections answers to some frequently asked questions. This Angels book has over 40 pictures of angels and guides - a very insightful book about someone who has had numerous angelic experiences. Author Sylvia Lavey brings to life, through words and numerous pictures, her many experiences with angels and guides. Her book captures what few could ever image exists in a realm that is for everyone to experience and to know. But, the real secret is, are "you" ready to accept and believe that angels and guides "really" are everywhere? Unless you are, you will never experience or ever know anything about what the author has written about in her book "Angels." I was hoping for something less new age and nebulous.